By Dr. Robin B. Dilley, author of In A Moment’s Notice: A Psychologist’s Journey with Breast Cancer & licensed psychologist. Psychotherapy is a journey of positive self-care, positive actions, positive thinking and positive being. It is an investment in yourself that does not get packed into a sixty- minute session once a week. Being a person surviving Breast Cancer you have invested countless hours in research, medical appointments, and treatment options and alternatives. Now, as I say to my psychotherapy clients it is time to focus on all of the other hours of the week that you are not doing treatment. Below is a guideline. Pick and choose what speaks to you. The list is not in any particular order. The time guidelines are just that, guidelines. 1.) Practice a daily time of meditation as a way to learn mindfulness. How: Make a safe place in your home where you can sit. Sit for ten minutes a day in the same spot. You can use music to listen to if you have a hard time with silence. Classical music or Tibetan Singing Bowls can be very helpful. Focus on your breath, breathing in deeply and exhaling slowly. Pay attention to your body. Breathe in and let go of the tight places. Notice your thoughts and let them pass on through, as if entering the front door and walking out the back door. 2.) Draw a circle and choose three crayon colors to represent your current emotional state. Take 20 minutes and color in the circle. Then choose a happy color and color the outside of the circle until there is now white space left. Next, name your piece of art and then put it away. Get up and go and do something on your to do list. 3.) Have a journal and record your thoughts and feelings. It has been proven by the Journal of the American Medical Association, that writing down your thoughts helps you feel better by allowing you to get your thoughts out of your head and down on paper. It provides you with a better sense of objectivity. 4.) Track your emotions, depression, anxiety, or personal problem on a scale of 1-10 every day. 10 is feeling great and in charge of your life. 1 is a state of overwhelm and victimization. On anything below 5 ask your self what you can do make it better for today? For instance, if your depression is a 1 what can you do to make it a 2? Any of the above exercises can be helpful. If it is 6 or above ask yourself what you are doing and can do to keep it there? 5.) Have an inner dialogue with yourself, your inner child, the compassionate mother within or a wise inner mentor. 6.) Breathe. Sit and count your breaths 1-10 three times, get up and do something else. 7.) 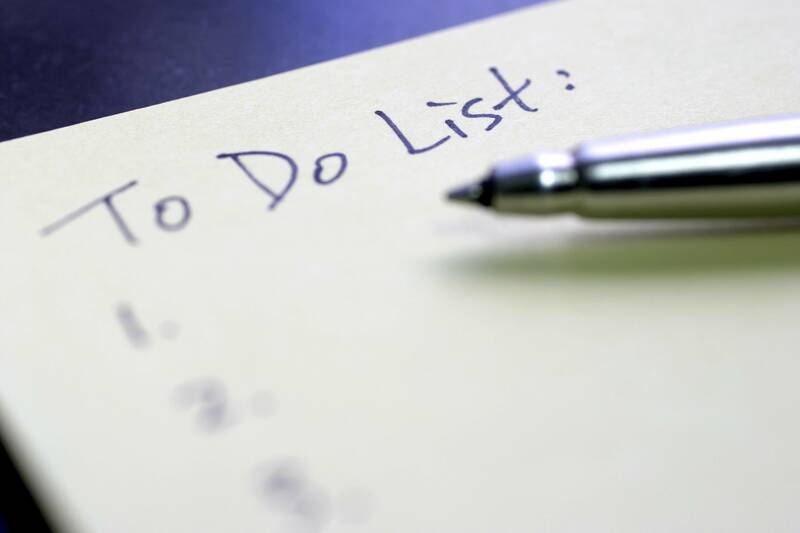 Make a to-do list and refer to it daily. Check three things off a day. 8.) If you are experiencing relationship issues, have you and your partner read a self help book and talk about it. 11.) BREAST CANCER survivors, focus on the positive things that you do each day to help your body heal and recover. Acknowledge the small steps. 12.) Keep a gratitude Journal and re-read. Robin as I embark on this “new” journey of self realization, your psychotherapy tools are perfect. I really feel that my soul is fractured, and my inner child needs nurturing as well as just me. Thank you. This comes at a timely moment. Wishing you a speedy recovery. Great Post! Love all the suggestions, but particularly attracted to the circle and crayon exercise. Such a great way to get in touch with your emotions and then visualize them. Ending with a happy color is a wonderful release. Also if anger is one of your emotions at the moment, pushing down hard on a crayon and really “ripping out” that color is a wonderfully cleansing action.